What a mess! It took three people helping to get me out of it. But I’m getting ahead of myself. It seemed so simple. 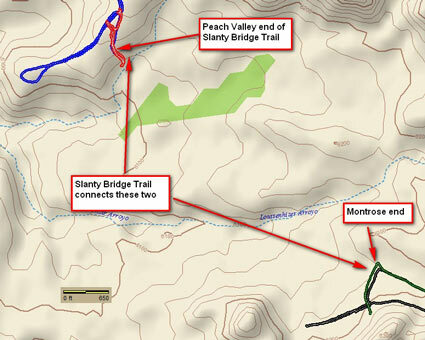 The “Flat Top Peach Valley Recreation Area Trail System Map” the BLM puts out has a section that says “Routes that connect the Flat Top Staging Area to the Peach Valley Recreation Area.” And for “beginner to intermediate riding” it suggests some trails that are not on the map that end up taking one over the Slanty Bridge Trail. Well, I’d been at the Slanty Bridge from the north—it looked like a bit much for me. Well, yesterday, with GPS in hand, I set out to connect the dots…that is, the GPS tracks I’ve taken on the Flat Top side to the ones taken from the Peach Valley side. As the crow flies, it’s less than a mile. What a mile! It seemed so easy. As the crow flies, it's less than one mile. Well, it took some wandering around to find the trail. I followed it north. Naturally, it had to cross an arroyo. Here’s a picture of what I thought was “the” arroyo, but was only the first of several. This is the first arroyo. Too bad you can't see it in 3D. The proper trail on the far side is the one to the left. And, yes, that's bridge down there in the bottom. And note that trail is single-track—only a couple feet wide. So, I stood up, looked where I wanted to be, and gave it a go. I leaned way forward to make it up the hill, and to my surprise did fine. And I made it through several more arroyos just like this one. Finally, I came to the very last arroyo, just as deep and nasty as the one in the picture. I’d say the slope up and out was a good 70% grade. I had no trouble getting down. I crossed the bridge, but unfortunately sat as I did so. That meant I headed up the slope sitting down—entirely the wrong thing to do! I have ever so much more control standing up. Well, I made it five whole feet short of where it leveled out and my tire tracked to the side of the trail. I did one of those wonderful zero mph fall-downs. Not all was lost. The area has some new wildflowers. No problem, I thought. I’ve fallen many times before. I was completely unhurt. But the bike wouldn’t budge. I worked for a solid hour getting that thing upright—it was not just on its side, but actually had gone just slightly over the edge, so I was trying to pick it up while standing on a steep, slippery slope. After studying the matter for a very long time, I dragged the bike a few feet sideways and got it up. And then it wouldn’t start. It seems (my fault again) that I never bothered to turn off the ignition when the bike went down, which meant the battery was nearly dead from powering the headlight for an hour. The bike was upright, but on a steep slope. Finally (and this took serious doing) I got it back down to the bridge and started to troubleshoot. Still no go. Kit suggested I look at the air filter. I didn’t see how that would affect things, but something told me to look anyway. It turned out the air filter was full of gasoline! So we literally—and this is the literal truth—literally turned the bike upside down to drain the gasoline! Once righted, the bike coughed a bit, but by then we’d worn down the battery again! Here's the track. 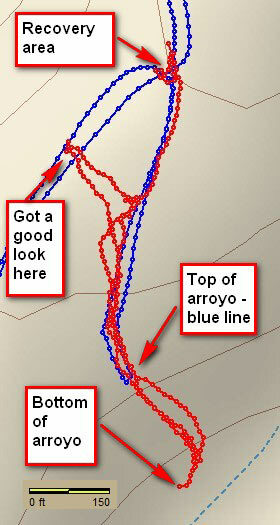 The GPS didn't start tracking until I was in the arroyo—I have no idea why it didn't work before. I was out in the open and should've had a good signal. Note the scale—we're not talking long distances here. So, Eric got out some stout ropes. Between the four of us, we dragged the bike out of the arroyo. You can see from the GPS track how close I was to the end. The red GPS track starts at the bottom of the arroyo and follows my meanderings, including on foot. The blue track is where I’d come from the north end. As you can see, I was only about a hundred yards from where I needed to be. Once we were toward the top (about where the blue dots start), Eric backed his truck down and we attached the rope to his trailer hitch. He pulled me the rest of the way out and to the recovery area. (I’m on the bike—two very elastic ropes.) For the last little part, I slipped the bike into third and let out the clutch. After being dragged another hundred feet or so, the engine suddenly caught and the bike was operational as though nothing had happened! The bike went down a little before 3:00 p.m. We were out of there sometime around 6:00 p.m. All could have been avoided had I simply continued to stand while climbing out! Mea culpa! I express my heartfelt thanks to Kit, Randy, and Eric, who went a long way out of their way to rescue me from my own foolishness. And do you want to know the worst part? The GPS failed to take a track between where I started and where I finished! So I have no track of Slanty Bridge Trail! Guess that means I’ll have to try it again, but this time with someone else along. Oh boy, this looks like (it will be )fun! Great catalog of rides. I am just getting familiar with the entire site an you may have it allready but not being familiar with the area(s) an overview map showing montrose and/or one with ouray and a little flag of the area in general would help outsiders get an instant ideas of where the area is compared to a known town. Thanks! What a story! I’m so glad for cell phones and radios! Thank goodness you and your bike got back safe and sound.